A SpaceX Falcon rocket fitted with a Dragon capsule stands ready to launch at Kennedy Space Center Launch Complex 39A. KENNEDY SPACE CENTER, FL. 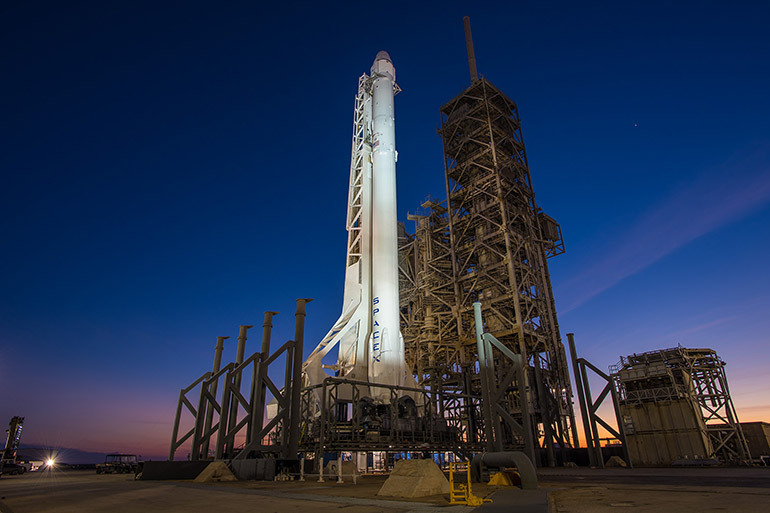 (November 20, 2017) – The SpaceX Falcon 9 vehicle is slated to launch its 13th cargo resupply mission (CRS-13) to the International Space Station no earlier than December from historic Cape Canaveral Air Force Station in Florida. The SpaceX Dragon spacecraft will carry more than a dozen International Space Station U.S. National Laboratory payloads to conduct research across a variety of areas aimed at improving life on Earth. From plant biology, to technology demonstrations aimed at enhancing bone growth, and more efficient treatments for the diabetic community, this launch will bring new innovative concepts through microgravity research. This launch will culminate a robust year of research on the U.S. National Lab, as more experiments than ever before have reached the orbiting laboratory. The goal of this investigation is to explore the ability of Tetranite™, a synthetic bone material capable of adhering bone to metal within minutes to accelerate bone repair. It is well known that microgravity affects bone cell growth and healing, mimicking the symptoms observed in osteoporosis. The investigators seek to evaluate the response of osteoblasts (a bone cell subtype responsible for renewing bones) to Tetranite™. Understanding bone cell-Tetranite™ interactions could provide insight into the post-fracture bone healing response and assist in the development of more effective treatments for patients with osteoporosis. In addition, this cell culture project should provide the basis for follow-on studies of the bone healing response in small rodents. This project will explore the effects of spaceflight on the germination of strains of an important food crop, barley (Hordeum vulgare), including proprietary strains under development. Observing changes in gene expression and germination after exposure to microgravity contributes to knowledge about how different cultivars (plants of the same species that possess genetic differences) that are better prepared to handle Earth-based stress, such as temperature extremes or water scarcity. An important ingredient for Budweiser, barley is also the 4th largest cereal grain grown in the world and is grown in diverse environments. Studying barley in microgravity may reveal new information regarding the germination process and identify key genes that enable some cultivars to survive in stressful environments. An extension to the CARA project to cover: 1) additional molecular analyses of the CARA samples, analyses that can significantly contribute to GeneLab and have been made possible by new advances in RNA isolation from small sample amounts, and 2) additional ISS imaging of plates (with no sample return) to extend data from the unique LMM imaging capabilities that were revealed by the initial CARA imaging. This project seeks to improve the accuracy of a wireless, medically implantable continuous glucose biosensor (Glucowizzard™) for day-to-day diabetes management. Slow glucose transport within human tissue (through the capillary walls and surrounding tissue toward the sensing site of the biosensor) can create delays of up to 20 minutes in real-time monitoring of glucose levels. This delay can be detrimental in achieving tight glycemic control, which has been linked to serious secondary complications in patients with diabetes. The International Space Station provides a microgravity environment in which reduced fluid movement allows precise monitoring of the role of diffusion in glucose transport, thus improving the mathematical models that determine the accuracy of the Glucowizzard continuous glucose monitoring biosensor. The World Health Organization projects that the global diabetic population will reach 366 million by 2030. In order to prevent serious health problems, many people with diabetes currently use glucose biosensors that may inaccurately measure their glucose levels prior to self-administering insulin. Biorasis is addressing this critical need by studying fluid movement onboard the International Space Station in order to optimize the Glucowizzard™ continuous glucose monitoring biosensor. An implantable drug delivery system that circumvents the need for daily injections will be tested in a rodent model with microgravity-induced muscle atrophy. Speciﬁcally, the drug formoterol, used in the management of asthma and other medical conditions, will be administered by controlled release from a nanochannel implant to achieve a constant and reliable dosage. If successful, this system could serve as a more reliable and accurate technology for drug delivery. In collaboration with Novartis and NanoMedical Systems, this validated system may rapidly translate into a commercial product. Sarcopenia, or muscle wasting, is a condition that affects more than 50% of the geriatric population, however therapeutics used to treat this condition are limited to physical activity or generic hormones. The most commonly used pharmaceutical intervention for sarcopenia is formoterol, but administrating these drugs requires a daily injection, which can be inconvenient. This collaboration between The Houston Methodist Research Institute, Novartis, and NanoMedical Systems plans to develop an implantable device that will safely administer formoterol over a long period of time, without patients needing a daily injection, improving quality of life. High-performance optical ﬁber is used extensively for the manufacture of efﬁcient and compact ultraviolet, visible, and infrared ﬁber lasers due to its low intrinsic loss, wide transparency window, and small phonon energy. This technology enables advances in many different sectors, including medical devices such as laser scalpels and endoscopes, sensors for the aerospace and defense industry, and telecommunications applications. The optical ﬁber ZBLAN has the potential to far exceed the performance of other ﬁbers in common use. Despite this, the terrestrially produced ﬁber suffers from physical impurities which contribute to light scattering and absorption loss, reducing performance. Microgravity has been shown to signiﬁcantly reduce these imperfections, and production of ﬁbers in space may enable not only improved materials but also new frontiers for manufacturing in space. This project will use existing SPHERES hardware to examine the active steering of a passive liquid-containing body in space. The Tether–Slosh experiment combines features of both the Tether–Demo and SPHERES–Slosh experiment into a single investigation utilizing hardware available on‐board International Space Station to conduct the experiment. By placing an acceleration sensor from Airbus DS into the Slosh tank and using an already certified WISENET sensor package, this experiment makes extensive use of resources already on International Space Station to generate data that will inform models for the automated steering of passive objects including disabled satellites. The small satellite market is projected to be valued at $5.32 billion by 2021; software that remotely enables the re-positioning of passive objects in LEO has the potential to expand small satellite use and accelerate satellite market development. This experiment will explore the effects of microgravity on a device for the continuous separation of immiscible liquids as part of continuous flow chemistry approaches. Continuous flow chemistry, the process of performing chemical reactions in a tube or pipe, has many advantages over batch chemistry for some applications, including faster reaction times, separation of reactants from products, quick reaction optimization, easy scale-up, and the integration of typically separate processes. While common separation methods rely on liquid sedimentation, this system has the unique characteristic of relying on surface forces to accomplish liquid-liquid extraction. To serve the needs of chemical production, the device needs to be scaled-up, which requires understanding the effect that gravity and length scales have on the flow path as it relates to separation efficiency. To learn more about these investigations and other station research, visit www.spacestationresearch.com. About the ISS National Lab: The Center for Advancement of Science in Space (the ISS National Lab) is the non-profit organization selected to manage the International Space Station U.S. National Laboratory with a focus on enabling a new era of space research to improve life on Earth. In this innovative role, the ISS National Lab promotes and brokers a diverse range of research in life sciences, physical sciences, remote sensing, technology development, and education. Since 2011, the International Space Station U.S. National Lab portfolio has included hundreds of novel research projects spanning multiple scientific disciplines, all with the intention of benefitting life on Earth. Working together with NASA, the ISS National Lab aims to advance the nation’s leadership in commercial space, pursue groundbreaking science not possible on Earth, and leverage the space station to inspire the next generation. About the ISS National Laboratory: In 2005, Congress designated the U.S. portion of the International Space Station as the nation’s newest national laboratory to maximize its use for improving life on Earth, promoting collaboration among diverse users, and advancing STEM education. This unique laboratory environment is available for use by other U.S. government agencies and by academic and private institutions, providing access to the permanent microgravity setting, vantage point in low Earth orbit, and varied environments of space.